The Golden State Warriors and Cleveland Cavaliers will clash in the NBA Finals for the fourth year in a row. This is The Roar‘s complete guide to the series, including how to live stream every match and watch them on TV. 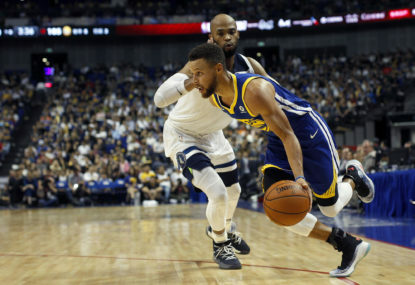 The NBA Finals are contested over a seven-match series, pitting the winners of the Western Conference against the winners of the Eastern Conference. While this season brought with it some challenges for Cleveland and Golden State, they beat the Boston Celtics and Houston Rockets, respectively, in Game 7 of their conference finals series to qualify for the biggest basketball series on the planet one more time. In their previous three encounters, the Warriors have had the better of the match-up, winning 4-1 in 2017 and 4-2 in 2015. The Cavaliers, on the back of LeBron James, caused one of the biggest boilovers in NBA history in between, coming back from 3-1 down to win 4-3 in 2016. The only way to watch every match of the NBA Finals on TV will be through ESPN, which is available exclusively on Foxtel through Channel 508. To watch the coverage, you will need to have a valid Foxtel TV subscription, complete with the sports package. Coverage of each game will start roughly half an hour before tip-off. The full schedule can be found at the bottom of this article. If you are looking to stream the NBA Finals online, there are a couple of options available to you here in Australia. The first of those will be through Foxtel. They have two exclusive streaming applications, being the Foxtel App and Foxtel Now. Foxtel Now is the better option for those without a TV subscription, while the app should be free to download and use if you already have access to Foxtel on TV. The other alternative is to use the NBA live pass. It’ll set you back $44.99 for the finals, as well as gaining access to next season’s summer league. Here at The Roar, we will have you covered from buzzer to buzzer of each game with a live blog.